Children’s bodies are in the business of growing so it is vital that they get the nutrition they need. But it is not easy, especially as they are going through the fussy toddler or choosy teenager phases. How can parents help ensure kids get enough nutrition? By including nutrient rich foods in meals and snacks often and keeping the supplement option in mind. Although supplements are not an equal substitute to food, they may help close the potential nutrient gaps. 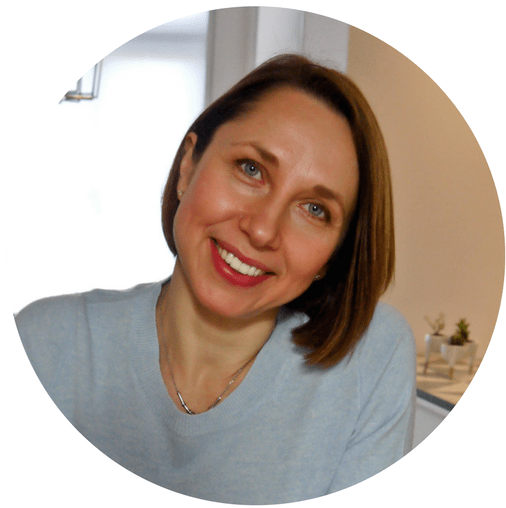 Got a picky eater and need additional strategies to help them get enough nutrition? Looking for recipes to put these recommendation to practice? 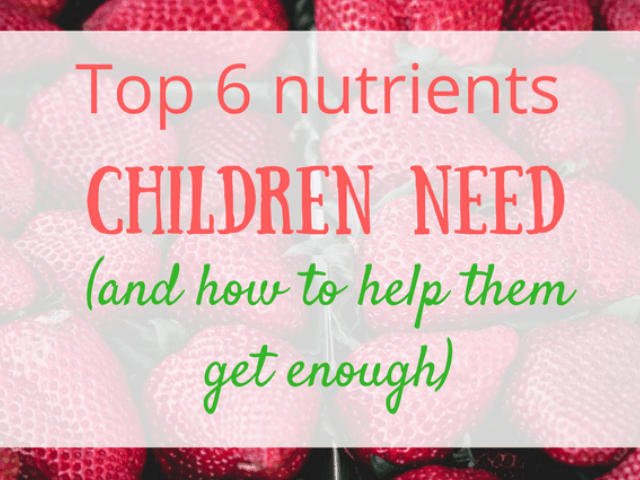 Get my full report 6 Top Nutrients for Children including easy recipes and picky eater tips. 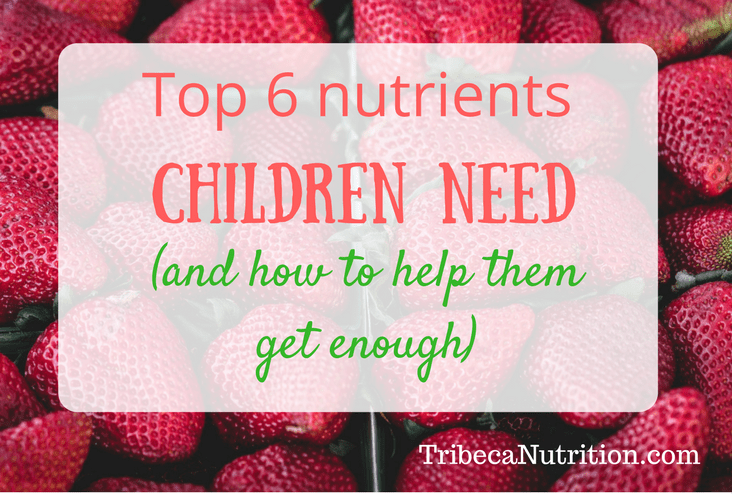 Here are 6 important nutrients for children and their best food sources. Vitamin D is important for calcium absorption, immunity, as well as reducing risk for chronic and autoimmune conditions. How much vitamin D your child needs daily? Vitamin D is not very common in dietary sources, unless the food is fortified. The best way to get enough vitamin D is through regular exposure to sunlight or by getting a supplement. But, depending on where you live and the color of your skin, it can be tricky too. The general rule is that the farther you live from the equator and the darker is your skin, the harder it is to get enough vitamin D from the sun. Vitamin D is the only supplement that I would recommend to 100% of my pediatric clients (and their parents). Sunlight and supplement! Some food sources of vitamin D include fortified dairy products, fortified cereals, egg yolk, cheese and fatty fish. Iron helps supply oxygen to cells and is especially important during periods of rapid growth. It also plays a vital role in brain development. Iron deficiency and iron deficiency anemia in small children may lead to low immunity and cognitive issues many years later. How much iron your child needs daily? It is estimated that iron deficiency affects about 7% of children between 1 and 2 years of age living in the US. This number is much smaller than that of children affected by iron deficiency in developing countries but is still a concern. In fact, in 2010 AAP issued a recommendation for a universal screening for iron deficiency at 12 months of age. 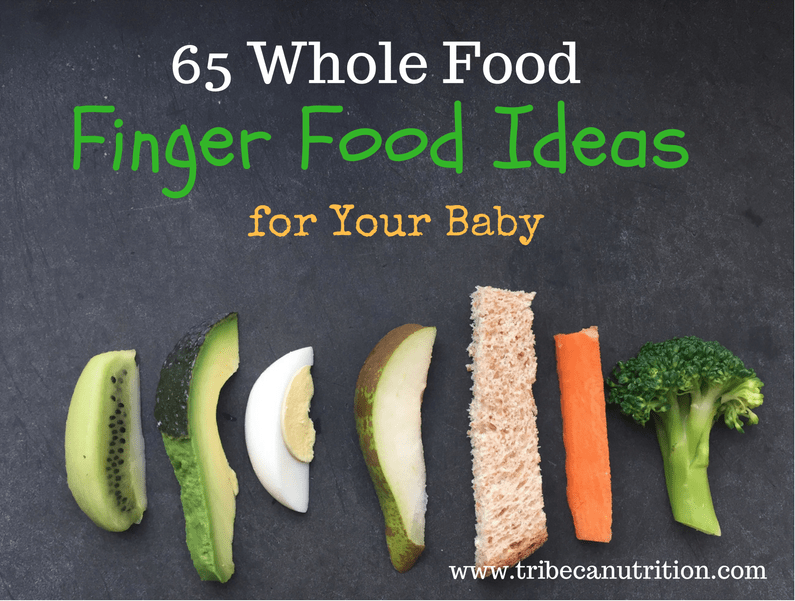 You are starting solids using Baby Led Weaning and your baby is not eating iron rich finger foods. Liver, red meat, egg yolk, dark chicken meat, iron fortified cereal, sesame seeds, beans, green leafy vegetables. Include these iron rich foods into your child’s diet twice a day. To help your child absorb more iron, combine iron rich foods with vitamin C rich foods, like fruit and vegetables. There are 3 main omega-3 fatty acids. Two of them, EPA and DHA, are especially important in pregnancy and early childhood. EPA (eicosapentaenoic acid) and DHA (docosahexaenoic acid) are critical for various functions in the brain, cardiovascular system and immune system. Did you know that about 50% of brain is fat and most of it is Omega 3s? Although we can convert the plant form of Omega 3 – ALA to EPA and DHA, we don’t do it very efficiently and the conversion rates are very low, especially for DHA. As a result, ALA cannot be a substitute for DHA (needed for brain development) in young children under 2. If your baby or toddler is vegan or vegetarian, he may need a supplement to meet his needs. How much Omega 3s your child needs daily? Many children in the USA and UK are not getting enough Omega 3’s, mostly because they do not eat enough fish. If you are raising a picky eater, you know how hard it is to learn to like fish. Many parents and do not serve fish often because they are concerned about mercury. Another risk factor for not getting enough Omega 3’s is following a vegan diet. Since ALA (plant type of Omega 3) is not absorbed as efficiently as DHA or EPA (fish type of Omega 3), your child may need a supplement to support his growth and development. Kids hate fish? 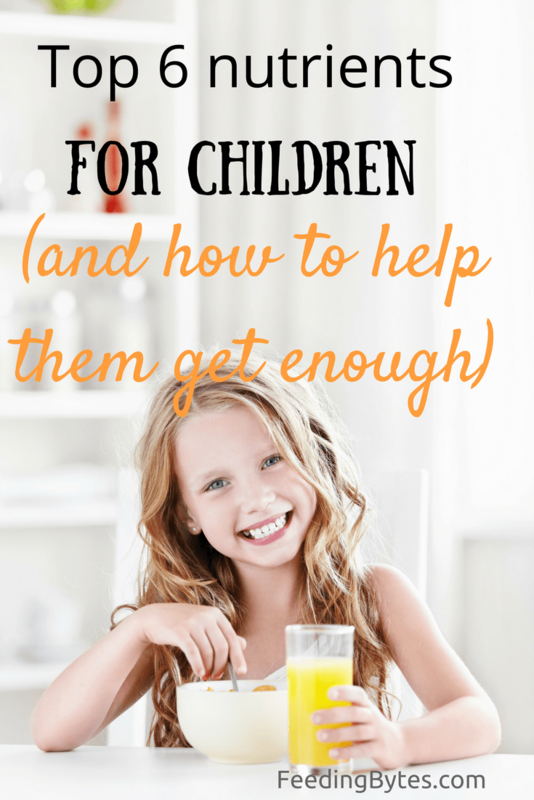 Get my full report 6 Top Nutrients for Children including easy recipes and picky eater tips. DHA and EPA are found in cold water fatty fish like salmon, tuna and sardines, fortified eggs, fortified milk and breast milk. ALA comes from plant foods like nuts and seeds and their oils. Serve to your child up to two servings a week of fish low in mercury. Click here for recommendations on how to choose safe fish for you and your child. Fiber, the non digestible carbohydrate component of plants, helps prevent constipation. It is also a great source prebiotics – perfect food for gut-benefiting probiotic bacteria. Fiber gets fermented in the colon to produce short chain fatty acids that may reduce risk of many health conditions including inflammatory disease, type 2 diabetes, obesity and heart disease. How much fiber your child needs daily? Most likely, no. Most children (and adults) in the developed countries barely get half of the recommended minimum of fiber. In fact, it is estimated that about 10% of children in the US are chronically constipated. Toddlers, teenagers and picky kids of all ages are more likely to not be meeting their fiber needs because they are not eating enough whole grains, fruit, vegetables and other fiber rich foods. IMPORTANT: Too much fiber may be not a good thing either, especially in small children under 2 years of age. Since fiber speeds up the food movement in the digestive tract, it may interfere with nutrient absorption. Beans, whole grains, nuts, seeds, fruit and vegetables, berries, bran cereal. Serve your child one fiber rich food with each meal and snack. Protein is our bodies’ structural block. Some proteins also function as enzymes, antibodies and hormones. Getting enough protein is extremely important for growing, development and immunity. How much protein your child needs daily? Most kids in developed countries get enough protein. But if your child avoids dairy and meat or is vegetarian or vegan, he may be at risk. Another risk factor – a picky toddler who drinks plant milks that are low in protein. Meat, fish, poultry, cheese, yogurt, milk, nuts and seeds, beans, lentils and grains. Try including a good source of protein in each meal and snack your child is eating. Apart from the well known benefit of building strong bones and preventing teeth decay, calcium is required by nerves, muscles and heart to function properly. It is very important that enough calcium gets “deposited” in children’s bones early in life, to prevent osteoporosis further down the road. That’s why helping your child build strong bones is a once-in-a-lifetime opportunity and getting enough calcium in early childhood is the key. How much calcium your child needs per day? If your child is a typical milk guzzling and cheese loving toddler, chances are he is getting enough calcium. A cup of milk or a serving of cheese contain 300-400 mg of calcium. But if your child avoids dairy products you may need to be more strategic with planning his diet to make sure he gets enough calcium. Fortified milk drinks (300mg per cup), fortified orange juice (270 mg per cup), fortified cereals (100-1000 mg per serving) as well as canned fish with bones, nuts, seeds, green leafy vegetables and greens are all good non dairy sources of calcium. Another risk group is teens whose calcium needs are higher than younger children. and diets are notoriously poor. Milk, cheese, yogurt, fortified plant drinks, fortified orange juice, fortified cereals, tofu made with calcium sulfate, canned sardines (with bones), canned salmon (with bones), kale, collard greens, bok choy, tahini, beans and almonds. To help your child meet her needs, aim to serve calcium rich foods 2-3 times a day. A balanced diet is important for children but it is unrealistic to expect them to eat a perfect meal at each sitting. If you are wondering if our child is getting the nutrition she needs, aim to serve nutrient dense meals and write down everything she eats over a week or two. In most cases, you will see that she is eating enough of nutrient rich foods. If your child is very picky, omitting whole food groups or vegan, you may need to talk to a pediatric dietitian like myself to help you ensure he is getting enough nutrition. Finally, before giving your child any supplements, it is best to discuss it with your doctor or dietitian first. Need more support with feeding your child? Join our FREE Facebook group. Would you like me to send you the summary of this post+recipes and picky eater tips? Get your Free downloadable below.